Parable of the Dishonest Steward (Luke) - at the midpoint of the Lenten period, 2010. About talent using with announcements explaining the Lenten Practices. 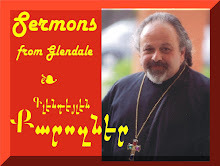 Recorded LIVE at the Armenian Church Youth Ministries' Center in Glendale, March 7, 2010. Language: Armenian.